Introduction Little has been published regarding how advancements in nerve graft have impacted their use in the treatment of upper extremity peripheral nerve injury. The purpose of this study was to assess trends in the use of nerve graft procedures following mixed peripheral and sensory nerve injury in the upper extremity. The National Inpatient Sample (NIS) was queried for upper extremity nerve injuries using ICD-9-CM diagnoses to identify mixed peripheral (Axillary: 955.0, Median: 955.1, Ulnar: 955.2, Radial: 955.3, Musculocutaneous: 955.4) and sensory nerve (cutaneous: 955.5, digital nerve: 955.6) injuries. Graft procedures were identified with ICD-9-CM procedure code, 045. Demographic variables, hospital characteristics, total charges, length of stay, and complication rates were analyzed. Rao-Scott Chi-Square Tests, Fisher's exact tests, and multivariable regressions were used with p-values < 0.05 determined significant a priori. Between 2002 and 2014, 128,115 patients suffered upper extremity peripheral nerve injuries, of which 25.9% (n=33,204) were sensory and 74.1% (n= 94,911) were mixed. 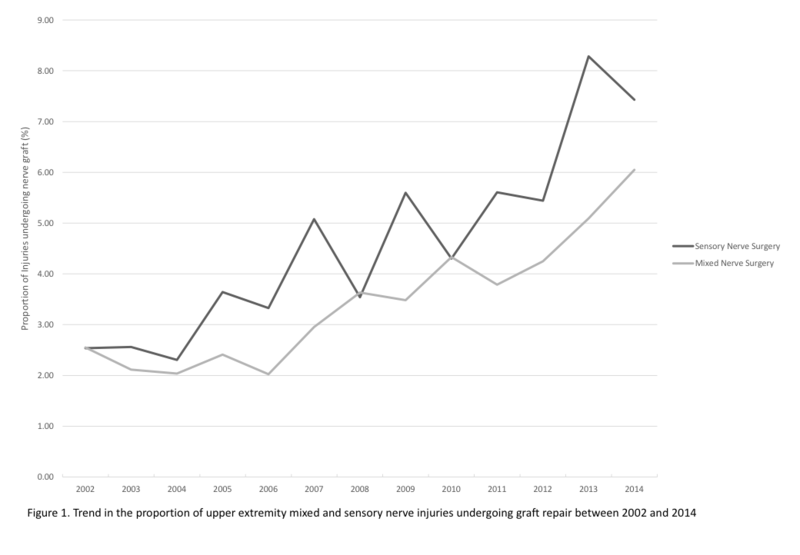 Mixed peripheral nerve graft procedures increased from 2.55% in 2002 to 6.05% in 2014 (p<0.0001) and sensory nerve graft procedures from 2.53% in 2002 to 7.43% in 2014 (p<0.001) (Figure 1). Males were 1.7 times more likely to undergo nerve graft than females (95%CI: 1.327-2.055, P<0.001) and sensory nerves were more likely to undergo graft repair than mixed nerves (OR: 1.2, 95%CI: 1.09-1.49, p<0.01). Teaching hospitals were 2.2 times more likely to perform sensory nerve graft procedures (95% CI: 1.534 – 3.221, p<0.001) and 2.5 times more likely to perform mixed peripheral nerve graft procedures (95% CI: 1.94 – 3.229, p<0.001) than non-teaching hospitals. 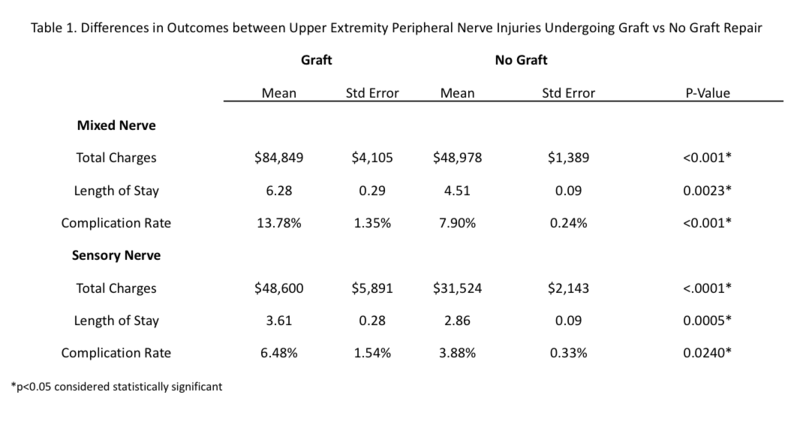 Total charges, length of stay, and complication rate were significantly less following sensory nerve graft procedures than mixed peripheral nerve graft (p<0.01) (Table 1). Conclusions: Our findings demonstrate increasing use of graft to repair mixed peripheral and sensory upper extremity nerve injuries over the past decade. Males, sensory nerves, and teaching hospitals were found to be significantly associated with graft repair. Continued research is needed to reduce complications and cost for those undergoing nerve graft procedures and to improve outcomes following mixed nerve injury.